Help your guests keep track of their drinks during a party with these quirky markers. 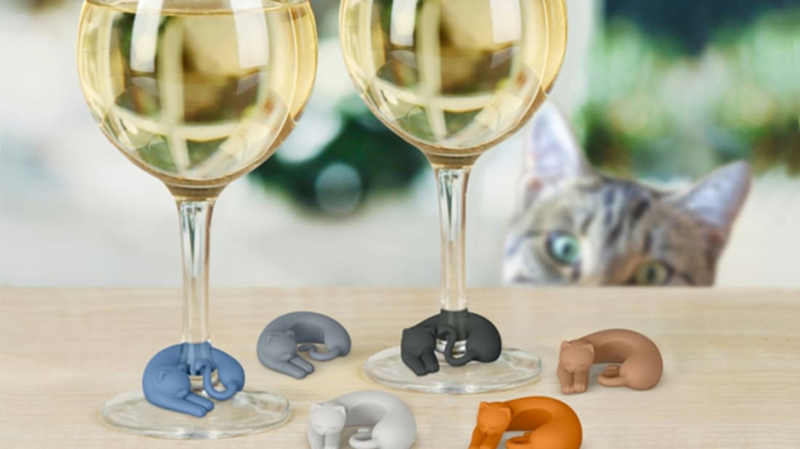 These adorable silicone cats take a nap while wrapped around the stem of a wine glass. The pack includes cats in six different colors. For something a little livelier, these cats are peeking into your glass as if looking into a fish bowl. They come in six different colors and are dishwasher-safe. These colorful silicone rubber fish fit snuggly around wine glass stems. These quirky drink markers are meant to fit around the neck of a bottle. When the drinker takes a sip, it looks like they’re sporting a dapper mustache. The kit comes in six different colors, including a bright green one that would be great for a St. Patrick’s Day party. These deer busts are made from silicone and fit on the rim of your glass. They're useful for more than just boozing: You can also put them on a tea cup and wrap the teabag's string around their antlers. Turn any drink into a tropical cocktail with these umbrellas—which, unlike typical paper drink umbrellas, are made with silicone and can be re-used. Personalize your glass with these plastic suction-cup markers that replicate wax seals used on correspondence in the old days. Make your get-togethers a little spookier with these macabre drink markers, which sit on the edge on your glass. The overall effect? A much more intimidating-looking cocktail. These little plungers, which stick to the side of your glass with the help of tiny suction cups, come in eight colors and are just small enough to keep from getting in the way. Now you and your beer can both have beer goggles on. The adorable charms come in six different colors and are dishwasher safe.